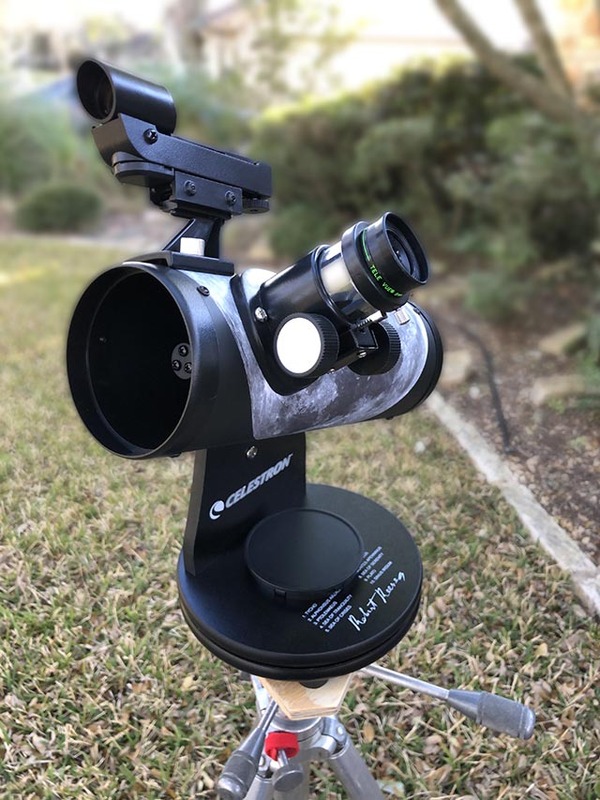 The Celestron 76mm FirstScope is a table top single arm mini-Dobsonian telescope that is very inexpensive at about $50 list. It's occasionally less than $40 on sale. Like all Dobs, an inexpensive Alt-Az mount allows the manufacturer to provide a solid, easy to use, mount, along with fairly good optics, at a reasonable cost. A table top mount limits use to where a table is available. 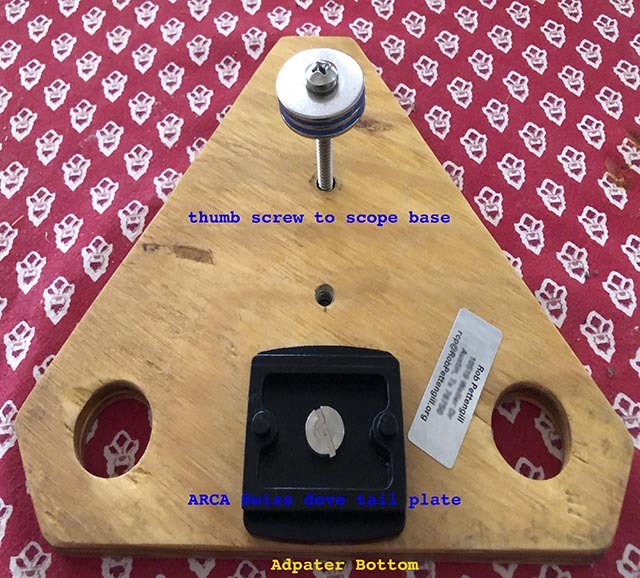 With the simple inexpensive adapter described below, a FirstScope or similar table top telescope can be used anywhere with a sturdy camera tripod. With an additional minor modification to the base of the FirstScope, it can be polar aligned and used in an equatorial orientation. A bright (f/4) short focal length (300mm) wide field reflecting telescope with a spherical mirror. The spherical mirror guarantees some geometric aberration off axis. Collimation is easy to adjust at the secondary. The two included eyepieces are very inexpensive 20mm and 4mm. The 4mm has too little eye relief to be useful and both have a small apparent field of view. Celestron's optional accessory package includes a couple more cheap eyepieces and a straight through finder. I don't think that these are a good choice and suggest better alternatives below. This scope is a lot of fun for a very low price. You can see Jupiter with its moons and the rings of Saturn, but without much detail. Large deep sky targets like the Andromeda Galaxy and Orion Nebulae are within reach. This scope does better with wide field views of large open clusters like the Pleiades and Bee Hive clusters and is great for scanning through the Milky Way. It's rugged but small and light enough for frequently casual use. You can give it to a young child without worrying about the cost of an accident. 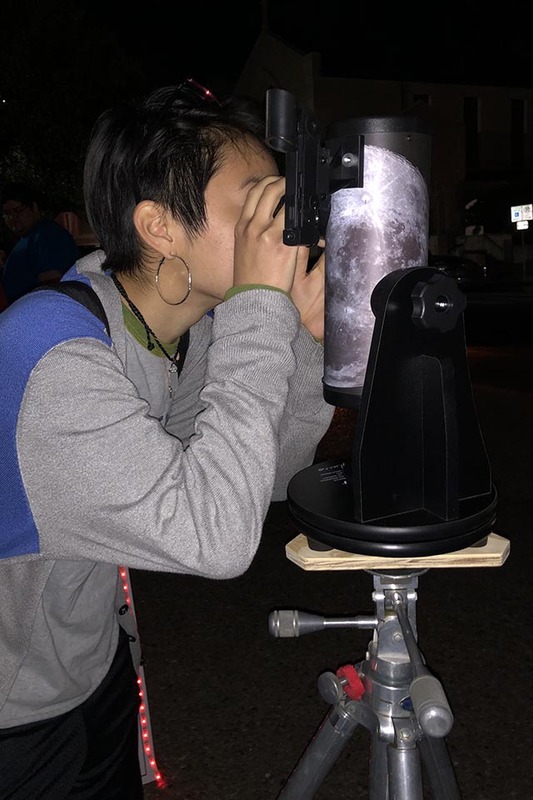 For the price of inexpensive binoculars, you get a brighter view in a mounted telescope, which makes it easier to aim and share the view with others. The short focal length gives a wide field of view which makes it easy to find things. Closer up views of the moon or planets require either short focal length eyepieces with their limited eye relief or a Barlow lens. The eye pieces are standard 1.25” eyepieces and easily upgraded to Plössl eyepieces with a much wider field of view than the ones included. Upgrading the eyepieces is easy and the wider FOV and better eye relieve have a big impact. Two inexpensive Plössl eyepieces will cost about the same as the FirstScope, but they can be used with any quality telescope. Heavy high end eyepieces might improve the view near the edge of the field of view in a fast scope like this, but the FirstScope is too light to handle them well and limited by its spherical primary. Expect to spend about $25 each for good generic Plössl eyepieces. Avoid cheap straight through telescopic finders which are very hard to use. With a wide field scope like this a simple finder made from a straw or wire will work fine. A better option is a Celestron red dot reflex finder that fits. It is much easier to use and only about $15. The table top design is great when an outdoor table is available, but very limited otherwise. For use for sidewalk astronomy or star parties, I needed a tripod mount. I settled on a simple design which mounts a tiny table on a standard tripod with three holes for the feet of the FirstScope. 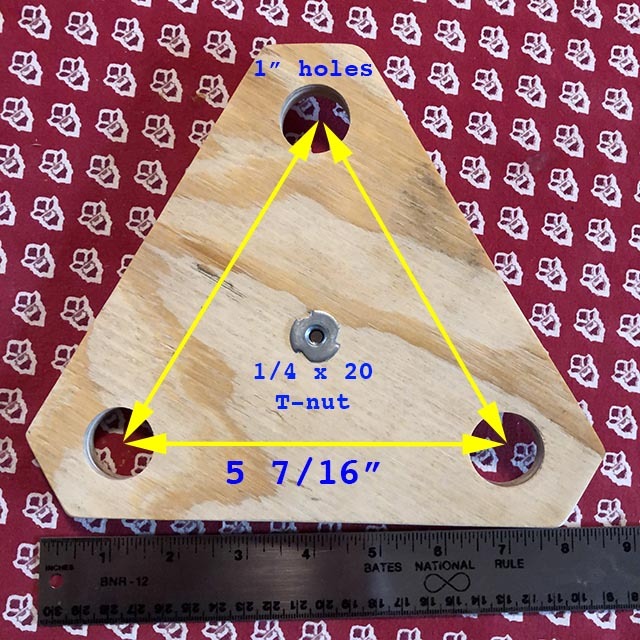 I started out with about a 8” square piece of 7/16” plywood. Next I drilled 3 1” holes 5 7/16” apart for the triangular legs. A 1/4x20 tpi T-nut placed in the center allows the adapter to be mounted on a standard camera tripod. 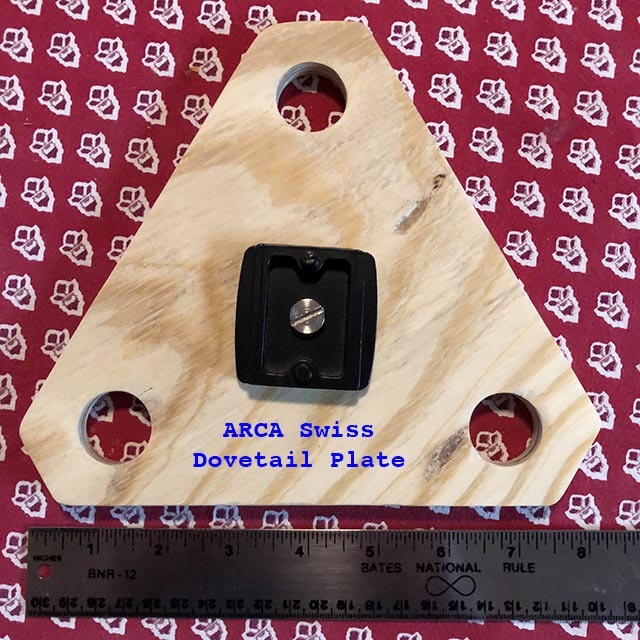 I added an ARCA Swiss dove tail plate to match my tripods. An equatorially aligned mount allows stars to be tracked with motion along the R.A. axis. 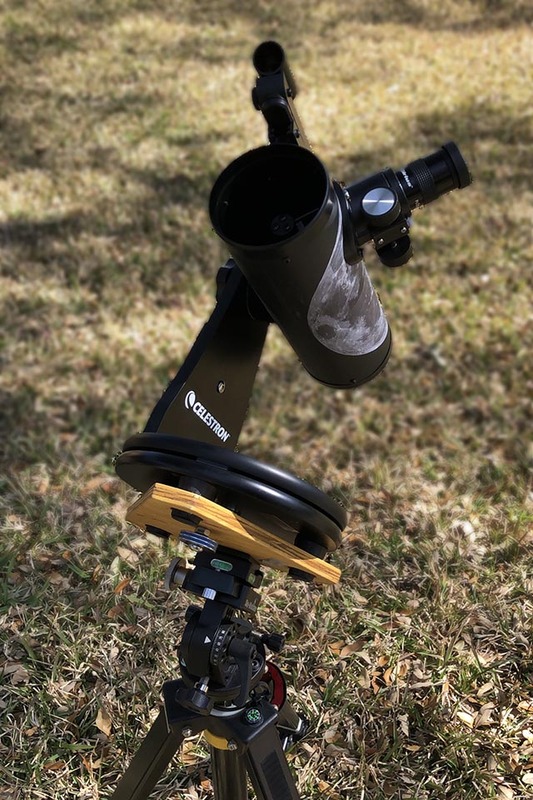 An Alt-Az mount can be converted to an equatorial mount by tilting the base with a wedge or other altitude adjustment to align the azimuth axis with the earth's. This isn't normally done with a Dobsonian mount because of the large weight and balance issues. It's quite feasible with a small table top telescope like the FirstScope. 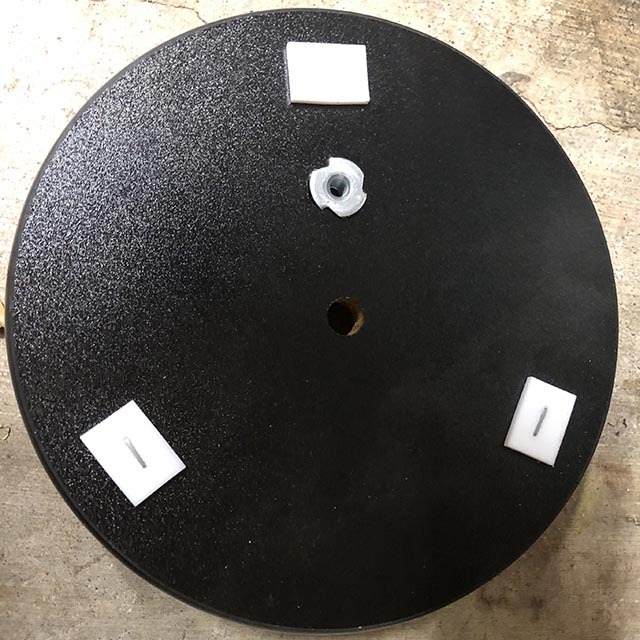 Depending on the tripod mount that you use to function as your wedge, you might be able to do it without an adapter, by simply adding an 1/4x20 T-nut to the bottom circular base plate of the FirstScope azimuth bearing. 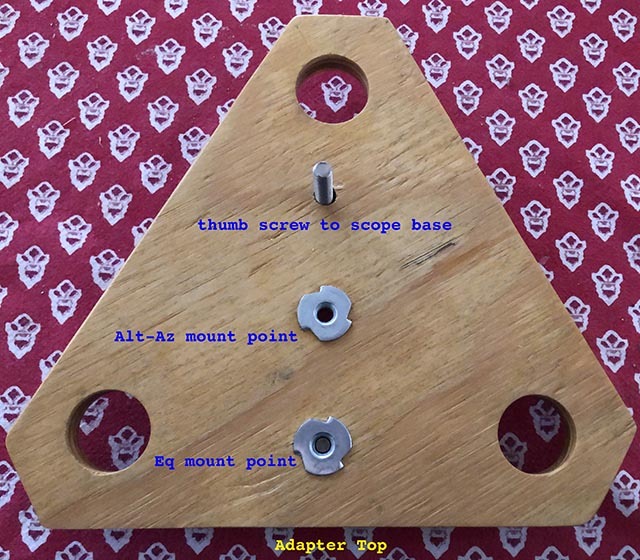 For my setup I use a modification of the Alt-Az adapter plate to avoid conflicts between the long feet on the FirstScope base and the tripod head. I've written a guide to choosing a starter telescope. It gives guidelines and suggests some more capable and still moderately priced alternatives to the FirstScope.